This design comes from 'The Brogden Album', the album contained 1,593 designs for jewellery and goldsmith's work, mainly in colour and dating between 1848 and 1884. It is a unique record of the years in which John Brogden, an internationally celebrated 'art goldsmith and jeweller worked first in partnership and then as owner-director of his own firm. 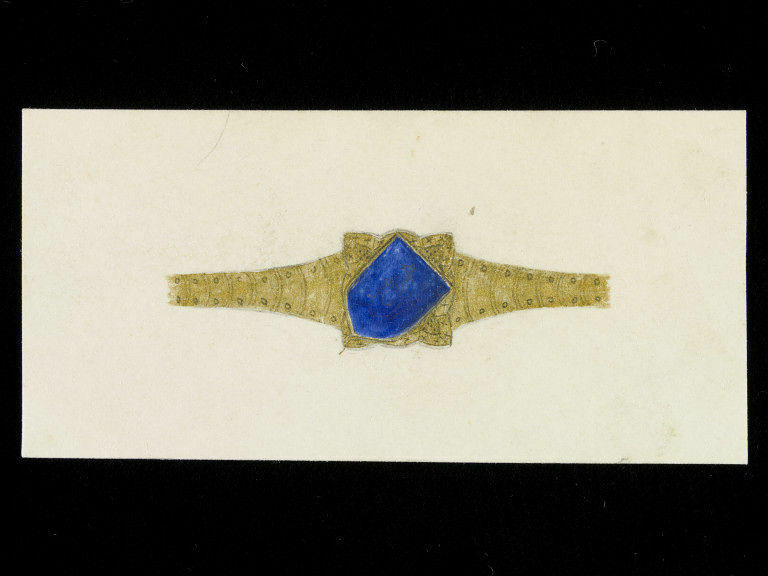 This was a period of great diversity in fashionable jewellery, and the Brogden firm where noted for their skill in designing and creating a range of styles. The firm was founded by John Brogden the elder in about 1796. From about 1824 to 1831 it was styled 'Brogden and Garland' and thereafter until 1841 'Garland and Watherston'. The younger Brogden, the son of Thomas Brogden and presumably a relative of the founder, served an apprenticeship to J.W. 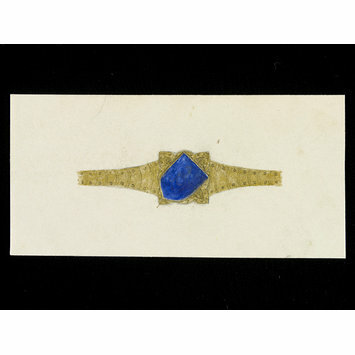 garland as a goldsmith and jeweller from 1834 to 1841. Following Garland's departure, the remaining partner, J.H. Watherston, removed the firm to new premises at 16 Henrietta Street, Covent Garden and in 1848 joined forces with the younger Brogden. Rectangular card with a pencil and watercolour drawing depicting a design for a gold ring with a blue shield in the central signet.